For some time now urban core proponents have boasted about a "return to the cities" from the suburbs. And while the urban core cities (historical core municipalities) have done better in recent years than before, the claim has been significantly overblown. Suburbs have continued to capture the "lion's share" of metropolitan growth in the United States. Moreover, suburban growth since the beginning of the overwhelming automobile oriented suburban expansion since World War II has been far greater than could ever have been explained by central city population losses (Note). Nonetheless, the catastrophic population losses in the urban core cities, especially 1970 through 1990 have slowed down or stopped completely in many areas. Sadly, some of the cities that have experienced the most significant turnarounds appear not to have learned important lessons of their previous declines. Take, for example, the cities of Seattle and Philadelphia (a combined city-county), whose city councils have revealed inclinations likely to raise concern among corporations seeking expand or locate under their jurisdictions. Seattle is thought by many to be the logical successor to the San Francisco Bay area, with its information technology industry and the new wealth it has produced. Metropolitan Seattle has become one of the world's premier information technology hubs, with Amazon in the central business district of the city and Microsoft headquartered in the suburbs. The city of Seattle's progress is of rather recent vintage. 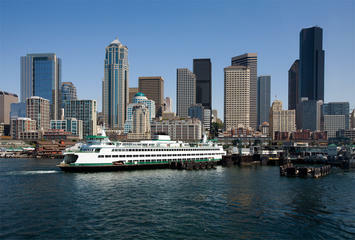 Like other urban core cities, Seattle had lost population from mid-century to 1990. In 1960, following a decade of major annexation, the city had 558,000 residents. By 1990, the population had dropped to 516,000. All the metropolitan area's growth for the last 30 years had been suburban. By the 2000 census, the city had reached 563,000, little above its population 40 years before. But the last two decades have seen much stronger growth. Since the 2010 census, the city has grown at a faster rate than any municipality with more than 500,000 population in 2017. Yet, even so, the city of Seattle accounted for only 12 percent of the metropolitan area's rapid growth between 1990 and 2017. Since 2010, the city's share of growth has risen to 27 percent. Emboldened by the growth, support developed on Seattle's city council to deal with its mounting homelessness problem and a head tax was proposed on companies with more than $20 million in annual Seattle earned revenue. After Amazon placed a hold on an under-construction downtown tower, and business interests objected, at least in part because "Past Council action on homelessness does not inspire confidence that they would use new revenue wisely and with accountability measures that track outcomes," the council halved the proposal and adopted it. Then a campaign for repeal by voters obtained enough signatures and money to frighten the city council into repealing the tax. The business concern about use of funds and accountability suggests that priorities and execution need improvement. That could lead to better results on the important issue of homelessness. Despite the temporary setback some proponents continue to believe that Seattle can just about do anything it wants, since it is perceived to be so desirable. For example, an Associated Press article quoted a proponent of the Seattle tax who said "It's frustrating to see the council be so spineless when the city has so much leverage for businesses to come here despite the tax." That is precisely the kind of thinking that could kill the "golden goose" not only of the city, but also the metropolitan area. The Seattle area lost its world headquarters of Boeing some years ago. Then Boeing started building passenger jets in the Charleston area of South Carolina. The extent to which local (and state) tax policies contributed to Boeing's significant reduction of its Seattle presence is known only to the Boeing officials who weighed the factors and made the decision. Moreover, there may be storm clouds on the horizon. Seattle has become one of the nation's most severely unaffordable metropolitan areas. The culprit is its urban containment policy, with its urban growth boundary. Seattle's house prices are now double their level relative to incomes compared to before imposition of the urban growth boundary, a pattern repeated in a number of metropolitan areas around the world. As the cost of living rises, metropolitan areas begin to lose businesses people to elsewhere. Already, King County (where the city of Seattle is located), has seen its domestic migration drop in recent years. In 2011 through 2013, King County accounted for between 60 percent and 86 percent of the metropolitan area's net domestic migration. That has dropped to 13 percent in 2017. Seattle's high rising costs, driven by its worsening housing affordability, could soon turn the metropolitan area's net domestic migration negative, just as it has in previous growth leaders Los Angeles, San Diego and the San Francisco Bay area. No city or metropolitan area can, in the long run, continue to attract businesses and residents if it allows its costs of living to get out of control. The city of Philadelphia is much different than the city of Seattle. From its peak population of 2,072,000 in 1950, Philadelphia lost about as many residents as lived in the city of Seattle at the beginning of the century, falling to 1,510,000 in 2003. But with its attractive urban core, and with improved crime rates, Philadelphia began growing again. By 2017, the city had 1,581,000 residents. But unlike Seattle, Philadelphia does not have a huge information technology presence. Its growth is more fragile, having added 55,000 new residents since 2010, less than one-half the 126,000 gained by much smaller Seattle. After having obtained none of the metropolitan area's growth from 1960 to 2000, the city accounted for 16 percent of the growth since 2000 and an impressive 42 percent since 2010. A factor, however, in that performance is the Philadelphia area's very slow growth. Among the nation's 10 largest urban core cities, only New York, Los Angeles and Chicago have grown more slowly since 2010. Philadelphia's city council seems to be at least as emboldened as Seattle's, despite the city's far more fragile economic fundamentals. A proposal to implement a one percent tax on new construction has gained considerable support. The money would be used for affordable housing programs. To their credit, Mayor Jim Kenney, the building trades unions (whose business manager calls the proposal "dumb"), and business interests are opposed. They, at least have learned an important lesson about how to snuff out the essentials of competitiveness. Urban core cities continue to battle structural challenges. Our own reports have documented the higher taxes, higher spending and higher debt levels per capita of larger municipalities in Pennsylvania, New York, Illinois and Ohio. Further expenditures per capita in the United States as a whole were found to be higher in larger municipalities. In Pennsylvania and Ohio, state programs to identify and assist municipalities that have fallen into fiscal distress have much higher per capita tax rates of such designation among larger municipalities. Some urban core cities may perform a greater array of functions than suburban jurisdictions, whose citizens often a slimmer package of government services. The urban core cities need to avoid policies that weaken their competitive situations and could lead to exporting people, jobs and businesses. The recent developments in Seattle and Philadelphia suggest that, with their special interest pressures, they may face unique challenges to maintaining their competitiveness in the years ahead. Note: There is considerable confusion about the origins of suburban growth. Much more of the gains came from outside urban areas, which attracted millions of new migrants. Indeed, since 1950, US urban areas have added more than 150 million residents, while rural areas added only 5 million. Overall, urban areas, ranging from populations of 2,500 to 20 million, had only 64 percent of the population in 1950. Yet through the next 6 censuses attracted 97 percent of the US population gain. The rest of the growth, only 3 percent was in rural areas. This was a significant turnaround, since in 1950, only 64 percent of the population was in urban areas and 36 percent in rural areas.